This 4th of July was made even more special because of the wonderful extended family gathering we enjoyed at our place on the Willamette River. It was a major family affair. We had 20 people, including two of my brothers and sisters-in-law. Our youngest grand niece, Reece, is about 2½ years old, and is as cute as a button. She brought her bicycle. (see attached photos) I'd never seen a learning bicycle like this before. It has two wheels, a little banana seat, and no peddles. That's right – no peddles! It's hard to call a bicycle with no chain or peddles. She just propels herself along by pushing her feet on the ground. She seems to love it. 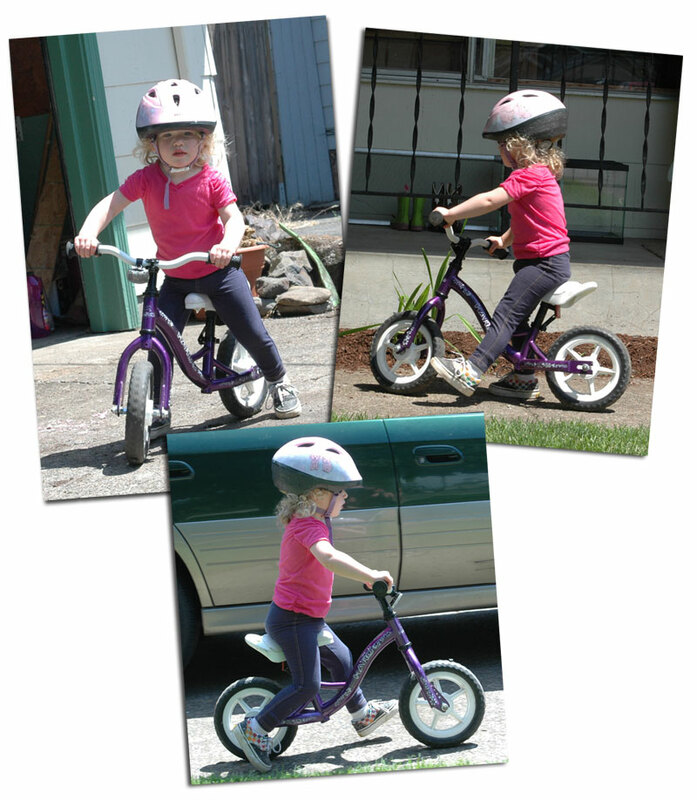 The idea is for her to learn to balance herself on this little 2-wheeler with no training wheels, and after she has learned to balance herself, she will graduate to a chain-driven peddle bicycle. My niece told me that she knows several families whose kids have graduated to the peddle bikes without ever having to use training wheels. There's always a better way!!! competitive, you must move past incremental improvements; you must move to order of magnitude breakthroughs. "Order of magnitude" breakthroughs could be when you completely eliminate a step from your process. This isn't to say that incremental improvements aren't important. They are, of course, and we need to strive for and empower our teams, every associate on the team, to look for and find incremental improvements. It is equally important, if not more important, to incentify "order of magnitude" breakthroughs that completely eliminate steps from your process. Technological breakthroughs of many kinds are allowing for this possibility. The handheld scanner the UPS driver uses has no doubt eliminated many steps from their process; reducing their costs, improving their customer service, and increasing accuracy and productivity. Step elimination is what you are striving for, what you are looking for, and need to achieve to maintain your competitiveness and eliminate your risk of becoming a commodity provider who can only compete on price. *Orders of magnitude are generally used to make very approximate comparisons, but reflect deceptively large differences. If two numbers differ by one order of magnitude, one is about ten times larger than the other. If they differ by two orders of magnitude, they differ by a factor of about 100. Two numbers of the same order of magnitude have roughly the same scale: the larger value is less than ten times the smaller value. This is the reasoning behind significant figures: the amount rounded by is usually a few orders of magnitude less than the total, and therefore insignificant.